This is an aerial photograph of the Giza plateau taken before WW ll. It appeared without attribution in an article written by Drs. Hawass and Lehner in Archeology Magazine. The photo was apparently used as filler and was unaccompanied by further text or explanation by the authors. With the sun at its lowest point on the southwestern horizon the first important note is struck by the shadow of the Great Pyramid attributed to the Pharaoh Menkaur. The tip of the shadow is in perfect synchronicity with the corner of an ancient temple courtyard. In its effect, the pyramid is acting like a sundial except its face is square rather than round. Once again, the architecture at Giza serves to square the circle. The shadow also completes a 3-4-5 right triangle. This alignment marks the winter solstice. As can readily be seen, at the same moment the shadow of Menkaur reaches the solstice point, the shadow lines of all three great pyramids fall into perfect alignment. This phenomena is of obvious intent. The idea that this is a matter of happenstance is idiotic. It identifies the building of the three great pyramids as a matter of a completely unified plan. This is to say that the architectural plans of all three pyramids were completed before any construction began. Once a year do the Great Pyramids mark, among other things, the start of a calendrical year. In this case on what we now call December 21st, the shortest day of the year. This represents a geodetic accuracy that transcends some 4,500 years. From approximately 2600 B.C. to the 20th century as the Christian world has it. Imagine… an earth commensurate clock with two moving parts… the sun and the Earth…that is still accurate after 4500 years ! No attribution is given as to the photographer, but it was someone who knew enough to be at the right place at the right time. Presumably, it was the same person who also labeled it. Whoever it was knew exactly what they were doing, so it is reasonable to assume that the labeling in the photo is accurate. We know where the Wall of the Crow ( with its dead horse,) is. We know where the Nazlet El Saman is. 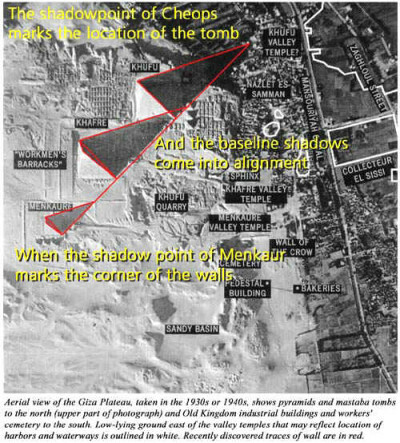 Therefore it is possible that the area labeled “Khufu Valley Temple?” is also accurate. Like many other geodetic structures, the design of the Khufu Valley Temple would have incorporated its own observable and calendrical sub-phenomena. The annual shadow point of the Great Pyramid of Cheops would allow its priests to very precisely observe the moment of solstice. This location then would be very auspicious, but would not have been possible until after the great Pyramid of Cheops had been completed. It may conceal the tomb of the Pharaoh. We have in this photograph proof of the spectacularly accurate earth commensurate design incorporated into the Giza Plateau by the genius of its unknown designer(s.) From its conception and construction to the present day, the Pyramid complex at Giza still functions to identify the beginning and end of the Earth’s annual cycle. Science being factually based and religion being a matter of mere belief, it is evident that the scientific facts exhibited with Great Pyramids far outweigh evidence of religious purpose i.e. that they were built as tombs. Even Dr. Hawass now admits there is no evidence for the old tomb theory he glorified for so long. The greatest mystery surrounding the pyramids is not who built them, how they were built, or why they were built ( although these are important questions,) but rather who is responsible for their design ? Ancient Egypt was incapable of educating anyone to the degrees necessary to incorporate the geodetic perfection represented in the Great Pyramids. Indeed, so called modern man was in the 17th century of the common era before our academic skills even allowed us to identify the mathematics and geometry known by the designers of the Giza Plateau. It is only in the last 20 years that we have re-discovered macrocosmic Pi [Science of the Maker] We do not even have legendary accounts of any ancient school, university, or temple system that possessed this knowledge. Modern archeology references a man named Amenhotep as the architect of both the Saqqara and Giza pyramids complexes, but this attribution is inadequate in more ways than one. So who was the invisible genius who gave the plan with its Earth commensurate scale? Where did he come from? Where did he get his knowledge? Did he come to it by himself in one lifetime, or had he been trained elsewhere, by others ? Why is it he left no specific personal identification to history? Certainly whoever he may have been, it is extraordinary that he could have accomplished this unrivaled feat of design, engineering, and construction without leaving a footprint or other mark behind. We do not even know his name. It would seem this person, and the Pyramids themselves, have been deliberately and specifically excluded from the elaborate hieroglyphics, statuary, and documentation that otherwise characterizes the ancient Egyptian civilization. Yet this architect remains invisible in history. Great genius with out ego. The base Great Pyramid of Cheops divides the surface of the Earth into equal squares. It identifies the circumference of the Earth as a whole number. The circumference is in inverse proportion in Time to a macro-cosmic expression of Pi even to nine decimal places. It establishes the ratio we call Pi as the universal constant of Time and Space. Its sacred geometry is the basis for all subsequent schools ( Pythagorean and Euclidean.) It gives us the scale by which the Science of the Maker may be identified by the Science of the Made. It provides the long sought linkage between the measures of Time and Distance. It represents applied science unsurpassed in modern times. The answers to who, why, when, and how are all contained within the Great Pyramid of Cheops. An entrance has been identified. The time has come to re-open Cheops. The distance when the Earth is closest to Sun (perihelion) is 147×106 km, which is translated into royal cubits 280×109, hinting at the height of the Great pyramid which is 280 royal cubits.